This entry was posted on January 15, 2018 by Woven Monkey. 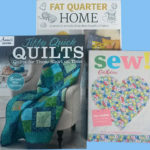 You could win one of three sewing related books: Sew by Cath Kidston, Fat Quarters Home by Amanda Russell & Juliet Bawden or Jiffy Quick Quilts by Annie's Quilting. So many new ideas to choose from! So, how do you enter? Simply place an order of £10 or more through our website over the next three weeks (15/01/18 - 05/02/18) and it will automatically be included in the competition. After each week, all entries over that 7 day period will be compiled and the winner chosen at random and announced shortly after via our social media platforms (Twitter, Facebook and Instagram). We will also confirm via email. Any orders received after the final closing date of 5th February 2018 will not be included in the competition. If you are a winner, your book will be included with your fabric order.